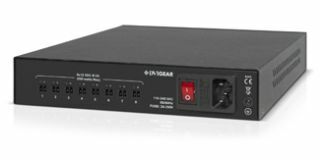 DVIGear is expanding its line of power management equipment with the DVI-7520-PDU, a new rack-mountable power distribution unit. Designed to satisfy the requirements of professional AV systems, the DVI 7520-PDU provides a power distribution solution for a wide range of professional applications. By providing centralized power distribution to multiple devices, the DVI-7520-PDU simplifies AV system design, integration, and support. The DVI-7520-PDU offers a Mean Time Between Failures (MTBF) of greater than 220,000 hours and provides +12 VDC power on 8x outputs, each rated for 24 watts. The unit has an overall power reserve of 200 watts and accepts AC line voltages auto-ranging from 88-264 VAC and AC line frequencies from 47-63 Hz. All outputs include extensive protection against overload, over voltage, and over temperature. The DVI-7520-PDU is housed in a 1U half-rack mountable enclosure with Phoenix connectors to allow for universal connections to various products that require +12 VDC power.